​Dr. 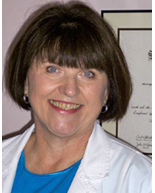 Moore has been in health care since 1972 as a registered nurse and in 1992 became a doctor of chiropractic. Dr. Moore received her Bachelor of Science in Nursing from Western Connecticut State College, and her Doctorate from Life College of Marietta Georgia. Dr. Moore has had vast medical experience, this experience helps her understand her patients better. Dr. Moore was born and raised in Connecticut and has spent time living in Louisiana, Georgia and Florida. In addition to being a nurse and doctor of chiropractic, Dr. Moore is a loving mother and wife. Both her children are now grown, and she and her husband enjoyed a beautiful Christmas wedding in Savannah in 2008. Dr. Moore's experiences have provided her with an excellent understanding of health and the ravages of disease. Wellness through prevention and education are crucial in her practice. Her mission is to provide her patients with more than pain relief. It is her pleasure to do this by giving fine tuned activator method adjustments as well as listening, providing information, tools, education and motivation towards improved health. Dr. Moore brings out your well being.